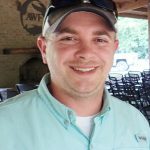 Kyle Stoffel, competitor in the Crappie Masters Alabama River tournament in May, says, “June crappie are very dependent upon water temperature. They’ll likely start in middle depths but migrate to deeper water as the water warms. Kyle Stoffel is from Alabama and is sponsored by Cathouse Marine and Yamaha.